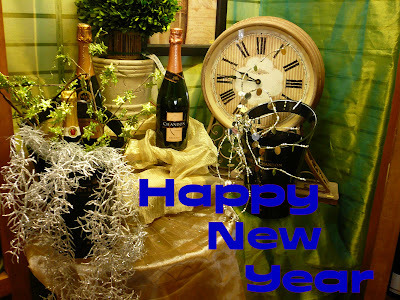 I hope all of you have a very HAPPY NEW YEAR. Enjoy your holiday! I’m pretty sure this isn’t the original paint job. I spotted this old car and just had to get a closer look. I think a more appropriate color would have been a better choice but, hey that’s just me. 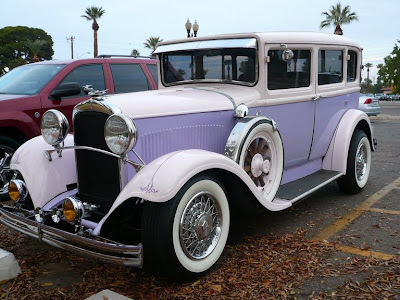 Unfortunately, I’m not an antique auto aficionado so I can’t tell you what kind of car it is or even how old it is. I’ll leave that up to you. Please excuse the alliteration. I couldn’t help myself. 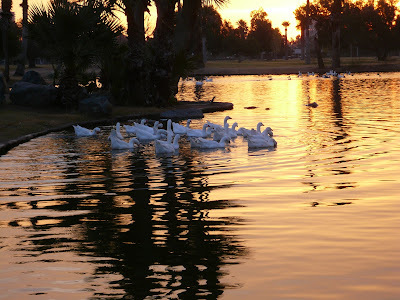 It's just another beautiful sunrise over the Encanto Park lake. 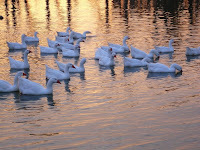 Many more than seven swans a-swimming. 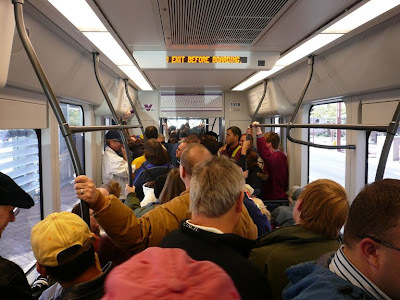 I took another ride on the light rail on Saturday and had to squeeze into the cars because of the crowds. Lots of people came out for the grand opening celebrations. 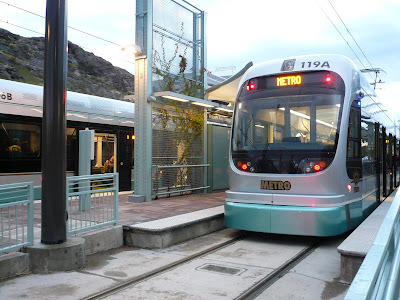 Today is the grand opening of the new Valley Metro Light Rail running between Mesa, Tempe, and Phoenix. This is a day that many of us have been eagerly waiting for. I was lucky enough to get an early morning preview ride (Thanks Tom) on Friday morning along with a lot of media people, politicians, and merchants who have businesses along the route. Grand opening celebrations will be going on all along the route today with big events in downtown Phoenix and Tempe and smaller events at other locations. It is expected that over 200,000 people will participate and I will be one of them. I hope to catch another ride today and stop at some of the event locations. 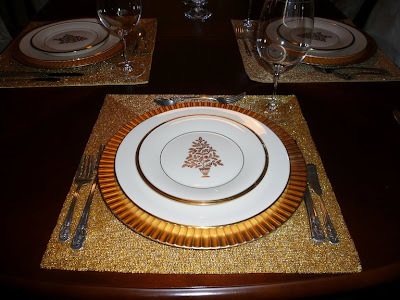 I love to cook so hosting a holiday dinner party is especially fun for me. This year’s dinner consisted of a salad of baby greens, slow roasted filet of beef with double mushroom ragout, individual horseradish bread puddings, asparagus roasted with garlic, Parmesan, and lemon flavored olive oil, and a gingerbread cake with cream cheese and pecan/pumpkin glaze. All of it was delicious but, the horseradish bread puddings were the hit of the dinner. They were very tasty. It’s unfortunate that I couldn’t seem to remember to take a picture of the actual food. I guess I was having too much fun with my guests. And, speaking of my guests, let me just say that while the food was great, the best part of the evening was spending it with dear friends who bring laughter, love, and joy with them. I'd like to wish everyone who celebrates Christmas a very happy holiday! I hope today is memorable and full of friends, family and good food. 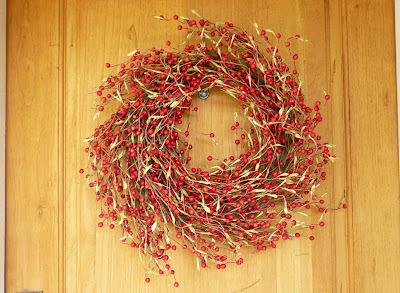 I chose a photo of the wreath on my front door to celebrate the day. On a personal note, I’d like to wish my sister Judy a very Happy Birthday. She is one of those lucky people to be born on Christmas Day. You can wish her a Happy Birthday too by visiting her site, Prescott Area Daily Photo. She started her site in mid-November and has been posting some fantastic photos from her city located in the mountains about 80 miles north of Phoenix. 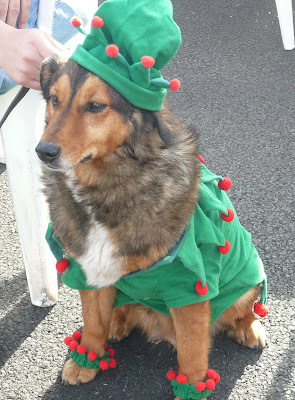 Santa’s elves come in all shapes and sizes. This one is all decked out in the appropriate attire and ready to help the big man with his deliveries! The magnificent saguaro cactus can grow to astounding heights, anywhere from 15 to 50 feet and they live for a very long time, an estimated 200 years! However, they have an amazingly shallow root system to support such grand heights and weights. Sometimes they need a little help, especially those that have been transplanted into a garden setting. 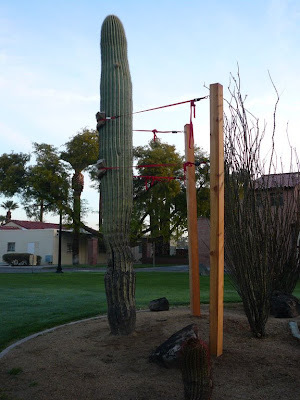 I spotted this one at Encanto park being supported so that it won’t topple over. The flower of the saguaro is the state flower of Arizona. Hopefully in the spring I’ll be able to capture a few blossoms to share with you. Actually, it’s the Encanto Park Golf Course. As you could tell from yesterday’s post, I got sidetracked by the fog on my way to get some sunrise photos. 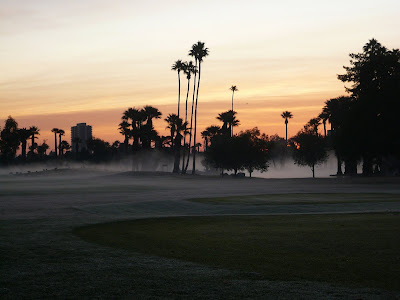 This one was taken across the golf course and you can see the fog rising and the frost on the grass. On a little rise to on the left of the photo, you can see ducks and geese hanging out on the greens. On a personal note, I’d like to say happy birthday to my sister Pam. I hope you have a wonderful day in the hills of Southwestern Missouri! 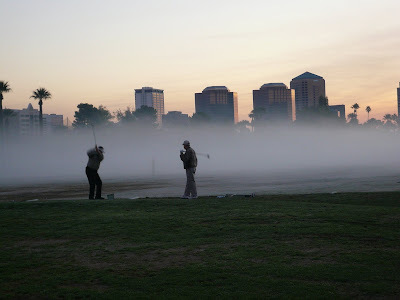 These golfers at the Encanto Park Driving Range seem to be saying “where did that ball go?” Saturday morning was a chilly one in Phoenix and when I saw the sun coming up I grabbed my camera and drove down to Encanto Park to see if I could get some good sunrise pictures. That’s when I spotted the fog over the golf course and decided that would make an interesting photo. It was about 42 degrees (F) and there were still dozens of golfers getting ready for a frosty round of golf. 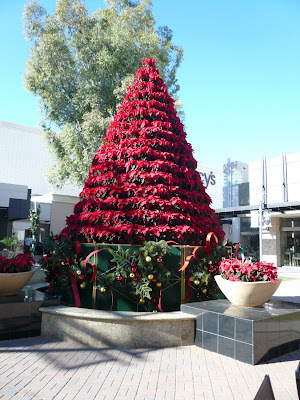 Every year, the Biltmore Fashion Park Shopping Center puts up a Christmas tree made entirely of Poinsettia plants. It is always a treat to see and no matter when you go, there are always people posing their children in front of it. I bet many of those photos end up in Christmas cards sent to friends and relatives. One more photo from my tour of the Viad Tower, this one showing the south lobby of the building. 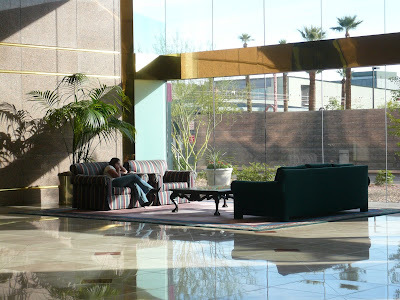 The main entrance to the building is on the north side, so this space is a large open area that creates a quiet and comfortable place to relax. 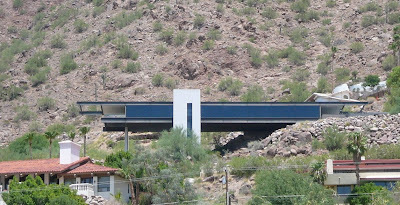 The building is located across the street from the Phoenix Art Museum and you can see a portion of that building out the window and over the top of the wall. By the way, the young woman in the chair is a real woman and not another statue. I saw her walk in, so I’m sure. I created this collage so that I could show you some of the sculptures that decorate the grounds and the lobby of the Viad Tower. In the upper left corner is “Museum Guard” by Gary Mirabelle, a sculpture that is so life-like that people approach “him” all the time looking for directions. Below the guard is “Best Seller” by J. Seward Johnson, Jr. This sculpture actually fooled me the first time I visited the park area. I was viewing this piece from the back and I kept wondering why someone would stop here to take an afternoon nap. In the center top is “Puddle Jumpers” a sculpture by Glenna Goodacre that I mentioned yesterday. Below the kids is “Nice to See You” by J. Seward Johnson, Jr., the window washer who has been working on this same spot on the window for quite a while now. 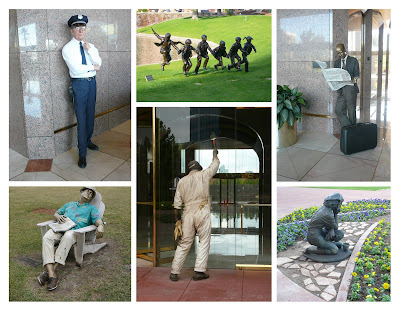 On the top right is “Catching Up” also by J. Seward Johnson, Jr. This sculpture is located in the building lobby where he stands reading his newspaper. The last photo on the bottom right is “Flora” by Jo Hess, a sculpture located in a flower bed near the entrance to the building. Flora is forever contemplating the flowers in her garden. This picture shows some of the beautiful park that surrounds the Viad Tower. In the foreground you can see a life-like sculpture called “Sightseeing” by J Seward Johnson, Jr. 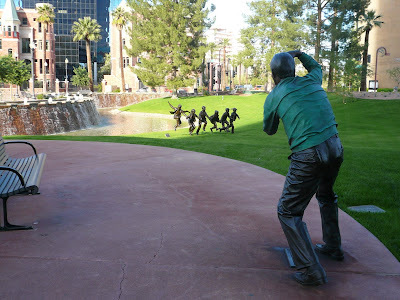 It depicts a man with a camera and the man appears to be photographing the children at play which is another sculpture called “Puddle Jumpers” by Glenna Goodacre. You may have heard Ms. Goodacre’s name before. She is the sculptor of the Vietnam Women’s Memorial at “The Wall” in Washington D.C.
To the left you can see the fountain that forms a stone wall that snakes across the park creating an artistic waterfall and small pool of water that was very popular with a flock of birds the day I was there. Tomorrow I’ll show you some of the art work that decorates this building. When the Viad Tower was built in 1991, it had a different name. At that time, the tower was called the Dial Tower after its major tenant, the Dial Soap Corporation. In fact, the top of the tower was designed to resemble the same curve you find in a bar of Dial soap. It is currently owned by the Viad Company, a marketing and travel business. Like other high-rise developments, this building was also supposed to have a twin tower situated at a 90 degree angle from this one. Instead of a second tower, the adjacent property has been landscaped into a spectacular private park area filled with interesting sculptures and an incredible fountain. Tomorrow I’ll show you a picture from the beautiful grounds around this building. 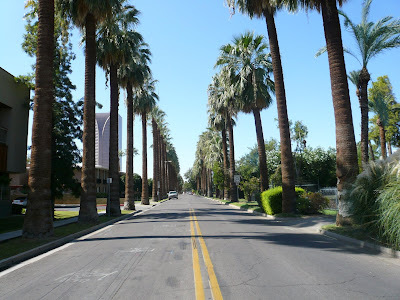 Palm Lane is a street in central Phoenix that, true to its name, is lined from one end to the other with tall Palm trees. There are a few office buildings located on this street but most of the street is residential and since it is in the heart of the city, it encompasses some historic neighborhoods and some beautiful homes. Through the trees you can see a high-rise building called the Viad Tower. Over the next few days I’ll feature that building and the area surrounding it. 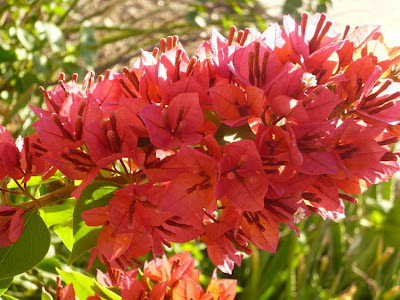 Bougainvillea is a flowering plant native to warm climate areas around the globe. The plants are popular because of their rapid growth and year round blooms. There are many varieties of this plant with blossoms of different colors. I have several of these plants in my yard including the one pictured above which is a hybrid that instead of blooming in big full clusters, the flowers bloom at the ends of a stem in a close formation. I’m sorry I don’t know the name of this particular hybrid but, I love the way it looks. I’ve been doing some cleaning lately and discovered some boxes of old negatives. I spent one whole weekend a month or so ago sorting out the negatives I wanted to keep and discarding the rest. The photo above is a result of one that I kept. Many years ago I traveled on some dusty and rutted roads and discovered an amazing oasis in the middle of what seemed like nowhere. Just northwest of the Phoenix city limits and completely hidden from any main roads by the cliffs and crags of the Bradshaw Mountains is place called Castle Hot Springs. 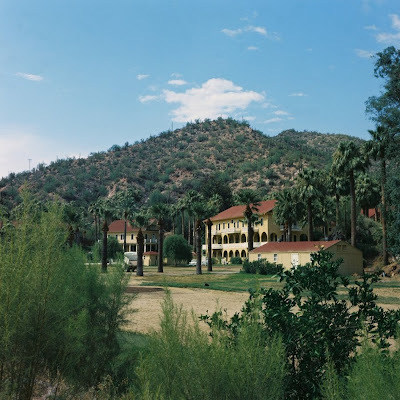 It opened in 1896 as a hotel to accommodate a surge of tuberculosis patients who had come to Arizona in search of relief. The waters of the hot springs were thought to have medicinal properties. It soon started attracting some of America’s wealthiest and well known families. During WWII it was leased to the military and was used to house recuperating soldiers including John F Kennedy who was seeking treatment for his injured back. When I first saw this place, I came around a rather rugged bend in the road to be greeted by green lawns dotted with white umbrellas over tables covered in equal amounts of white linen. In front of me in the middle of the rough Arizona desert was a garden party straight out of Cecil B. DeMille film! I went back a few weeks later to take pictures but was too late in the season for another garden party. The hotel you see in the photo above burned down in 1976 and shortly after that, the property was donated to Arizona State University. It has since changed hands several more times. As far as I can tell, it has never reopened as a resort. I’ll have to take a drive back there again and see what it looks like now. As the theme song from the old television series “Cheers” says, “sometimes you want to go where everyone knows your name”. That is exactly how I feel about Cheuvront Restaurant and Wine Bar. I can go there any time and there is always someone I know who will make me feel welcome. This eclectic wine bar, not only has great food but, great wines, delicious cheeses, and a friendly staff. The restaurant is owned by a good friend, Ken Cheuvront who along with his food and wine talents is also an Arizona State Senator. In addition to the normal menu, Cheuvront’s offers special wine tastings and delicious wine pairing dinners. I was attending one of those wine pairing dinners when I took the photo above. 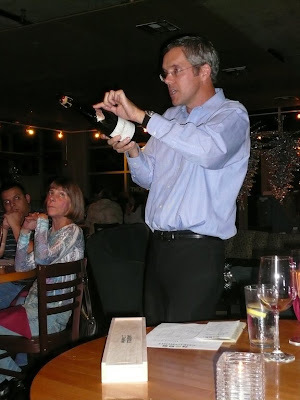 It shows Hugh Davies of Schramsberg Winery a well known Napa Valley maker of fine sparkling wines, demonstrating how he is going to take the top off of a bottle of bubbly using a special, extra sharp knife. The knife is still in its wooden box on the table in the foreground. He did it in one whack and got a perfect cut along the neck of the bottle. An amazing trick that I won’t be attempting at home. I would probably take off a finger or spill all of the wine. I don’t know which would be worse. 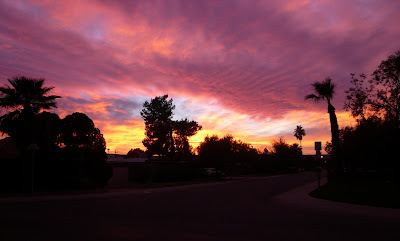 A few clouds in the sky contribute to a spectacular sunset here in the desert southwest. Taken from my front yard two nights ago, this one was exceptionally beautiful. 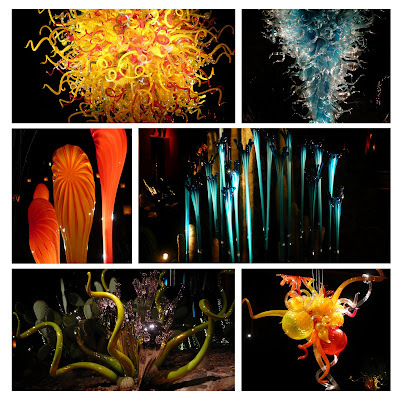 Today I feature a collage of some of the beautiful glass installations from the Chihuly exhibit at the Desert Botanical Gardens that I described yesterday. They are spectacular. My next order of business is to get tickets to the exhibit during the day. I’m sure you will be seeing more photos of these works of art in the future. The Chihuly exhibit will be at the gardens until May 31, 2009. For more information click this link. 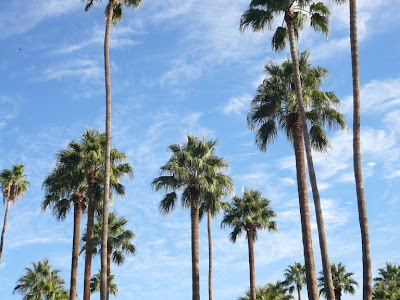 The Desert Botanical Gardens in Phoenix is truly one of the city’s most coveted treasures. I’ve featured photos from there on this blog before and I’m sure there will be more photos to come. The gardens are always changing and there literally hundreds of special programs sponsored by the gardens and attended by hundreds of thousands of people. During the holiday season each year, the garden opens its gates on several evenings for an event called “las noches de las luminarias” (the nights of the lights). During that event, the garden pathways are lit by traditional “luminarias” and the plants are highlighted with special lighting. This year the event was magnified by the garden’s most ambitious exhibit to date, the “Chihuly: the nature of glass” exhibit. I was lucky to attend one of these evening openings and found not only the illuminated pathways but, the fabulous Chihuly glass works shimmering with eye-popping beauty and radiance. 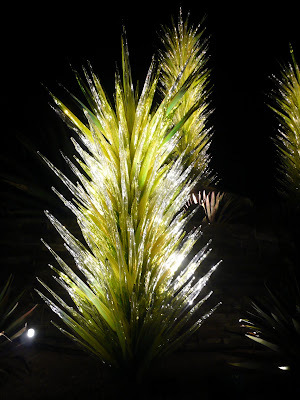 The photo above is just one of the breathtaking installations, a life size desert plant made all of glass. Dale Chihuly has done garden installations before in cities like Chicago, Atlanta, London, St. Louis and Pittsburg. However, this is his first exhibit in an outdoor garden setting. Tomorrow I’ll show you a collage of some of the other pieces that were glowing that night. This is my last photo from here, I promise. I just had to show you these two beautiful trees that shade the tables just outside the building. I notice that this area is now the designated smoking area. There are other tables located in the inner courtyard that can be used for lunch dining sans the cigarette smoke. Don’t these gorgeous old trees make a beautiful spot to take a break from life at a desk or in a cubicle? 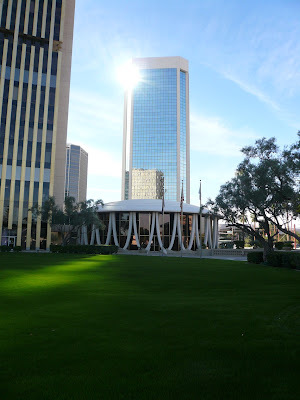 Continuing on the tour of the Phoenix Financial Center, this photo was taken across the lawn and shows one of the round buildings with an added bonus in the background of another office building located across the street. You can see the back of the curved tower mirrored in the glass of the building across the street. You can also see the brilliance of the hot Arizona sun peeking out from behind the tower. This photo is taken from the round building furthest away from the tower. You can see some of the landscaping and the sculpted pillars that surround each of the round buildings. If you look closely you can see that the curves of those pillars are mirrored in the paving of the sidewalk. You can also see the covered bridge that connects one of the round buildings to the tower. Since this building started out as a banking institution, it only makes sense that it would have drive-up windows for customers to make deposits. These two drive-in facilities serve the purpose with a little panache. Those round, mushroom-like covers are a very unique addition. 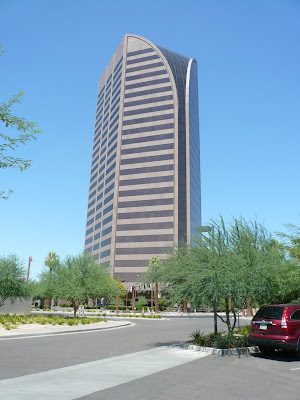 This view of the Phoenix Financial Center shows what the other side of that tall, curved building looks like. Those gold vertical piers break up the glass windows facing onto the manicured grounds below. The original tenant was Western Savings, a now defunct savings and loan bank. Western Savings was a victim of the Savings and Loan crisis of the 80’s. In the photo you can see a balcony about half-way up the tower. In 1964, the building only rose to that point. The second half was added four years later. Supposedly, the architect’s original vision called for another tower mirroring this one and encircling the center core. The two buildings would have served as tall brackets for the two small round buildings in front. 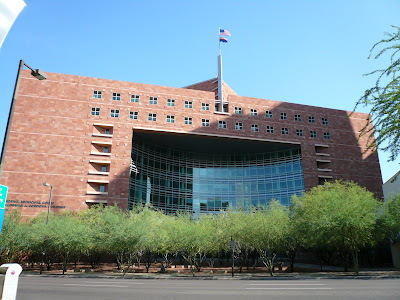 Located only a few blocks from where I live is the Phoenix Financial Center, an office complex that is a well known landmark for most Phoenicians. The unusual looking high-rise building pictured here is the centerpiece of this complex and two small, single-story, round pavilions complete the office buildings that make up the whole center. 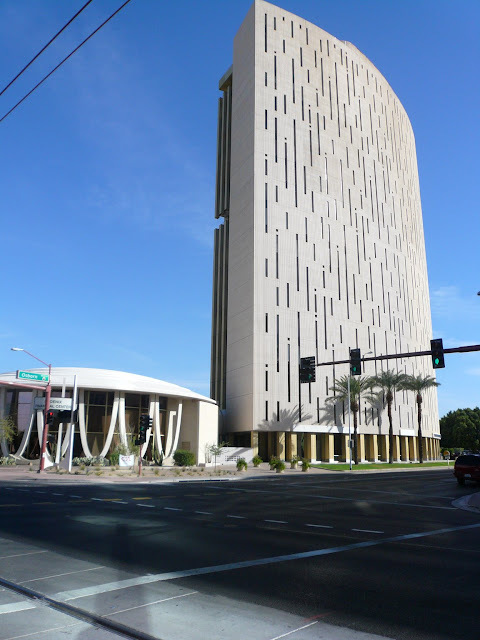 The back of the tower that is facing us in the picture is covered with slit-like windows that are designed to reduce exposure to the full force of the Arizona sun. 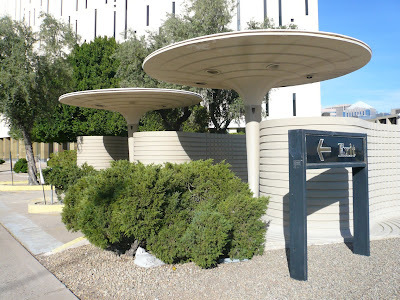 This unusual design has given rise to nick-names like “the punch-card” building or “the piano roll” building referring either to the old IBM computer punch cards or piano rolls used on old-fashioned player pianos. The three buildings were designed by Wenceslaus Sarmiento, a Peruvian-born American modernist architect. He studied in various places in South America and served as head designer for the Bank Building Corporation of American from 1951 through 1961. After that he founded his own business, Sarmiento Associates based in St. Louis Missouri. 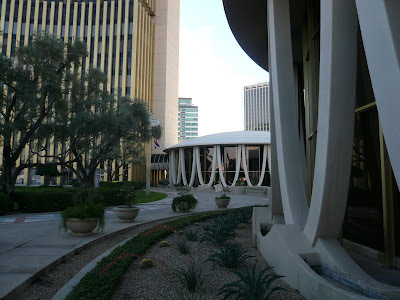 The Phoenix Financial Center opened in 1964. Over the next few days I’ll take you on a little tour of this center and the building that is so prominent on the Phoenix skyline. If you read yesterday’s post, you will realize that while trying to come up with a good representation for theme day, I went a little manic, seeing circles everywhere. I even saw them looking down at the sidewalks and streets and I started snapping photos in all sorts of places. 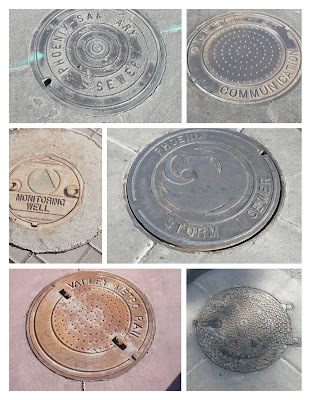 You can just imagine the curious looks I got when photographing manhole covers in various locations around the city. It’s odd that no one bothered to ask what I was doing. They just lowered their heads, quickened their pace, and hurried past. This month’s theme proved to be a bigger challenge than I thought it would be. The very first thing that popped into my head was Circle K, the chain of convenience markets that is headquartered right here in Arizona. But, then I thought “boring”. I thought I might get an artistic shot of the Native American Hoop Dancers who appear annually at the Heard Museum but, they don’t appear until February. About this time, I started seeing circles everywhere. When I set the table, the plates are circles, when I water the plants, the planter is a circle, when I drive my car, the tires are circles. Oh my gosh, even my mouse pad is a circle. Fortunately, I remembered this new piece of public art that is being installed at one of the new light rail stations. 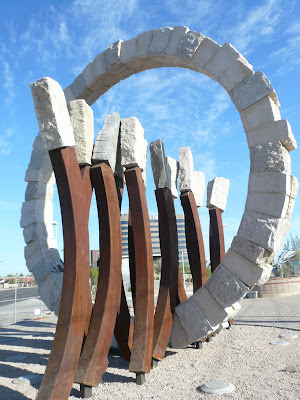 The new Metro Light Rail will open late this month and the station where this art work will prevail is located near the corner of Camelback Road and Central Avenue. It hasn’t been dedicated yet, so there is no plaque to tell me who the artist is or the name of the piece. It is definitely a circle and my thought is that it represents a portal or a gate to the future. By the way, does this make anyone besides me think of “Stargate”? 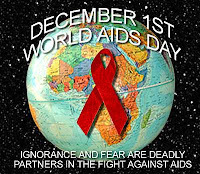 Reminder: The first of December is World AIDS Day, a day when people and organizations from around the world come together to bring attention to the world AIDS epidemic. Things have progressed a long way since 1988 but, there is still a long way to go to rid the world of this devastating disease. Just of couple of the things that come to mind when thinking of Phoenix Arizona. In a city that is dominated by the new and modern, it is unusual to find buildings with such traditional architecture. 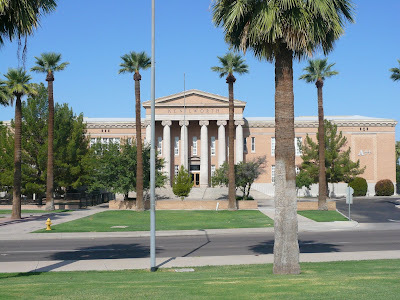 This is Kenilworth School, an elementary school that is part of the Phoenix Elementary School District. 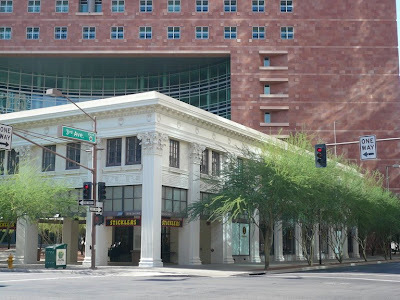 It is located in the Mid-town area of Phoenix just a few blocks from downtown. With the grand stairs and pillars, this building is very much like the schools I went when I was growing up in Illinois. Earlier this month I posted a photo from the Town & Country Shopping Center. As I said before, the fate of this center is up in the air but, for now it still hosts a number of shops. I thought I’d post another picture from the interior core of the center. 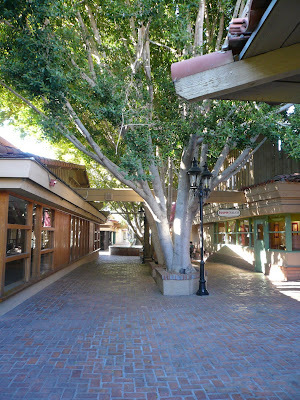 You can see the brick walkway and the lush, mature trees that make this place such a comfortable pedestrian place. 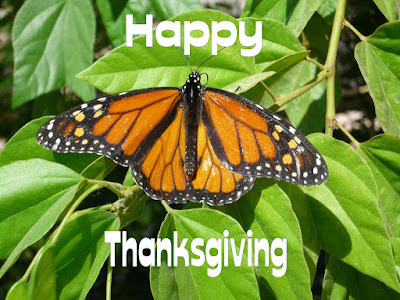 Thanksgiving is North American holiday set aside to give thanks for the things that keep us healthy and make us happy. Traditionally we spend this day with family and friends enjoying a plentiful meal (or two). I’d like to take this opportunity to thank all of you for the comments you’ve left on my site and making me feel welcome in the Daily City Photo Blog community. With the American economy holding on by a thread, I hesitate to show you this place. 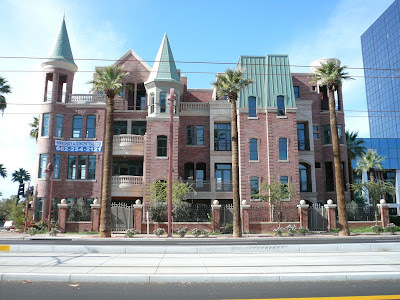 This is a very new development conveniently located on Central Avenue in mid-town Phoenix, just steps from the Phoenix Art Museum and the Heard Museum and a plethora of other popular community hot-spots. This development consists of 21, 5-story townhomes all with private elevators as well as other amazing amenities. Each unit ranges from the smallest at 5,100 square feet to the grandest at 8,200 square feet. They went on the market starting at 2.8 million dollars. Yes, you heard me right. I haven’t seen any information to indicate if they are still selling at that price or if they are selling at all. In fact, the development appears to be at a stand-still at the moment. It will be interesting to watch this place and see what happens as the problems with housing, lending, and the economy continue to unfold. Since I was traveling along the Camelback Mountain streets yesterday, I thought I’d bring you one more home perched among the rocks that make up this distinctive mountain. This home is a little more traditional in style than yesterday’s super-modern home, but it’s cliff-like setting in the red rocks make it a striking photo opportunity. 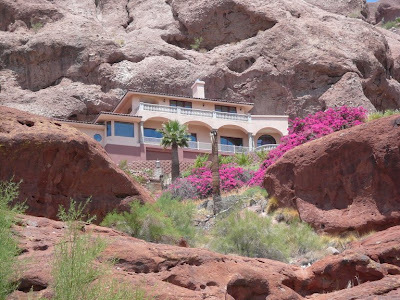 Today I bring you a rather unusual home perched on the side of Camelback Mountain. This is the kind of house that I would normally associate with Los Angeles, maybe on the slopes of the Hollywood Hills? It stands out among the low-slung ranch homes around it. I like to imagine who lives in it and what the inside must look like. I imagine the views are amazing, the furniture is ultra-modern, and the décor is minimalist. 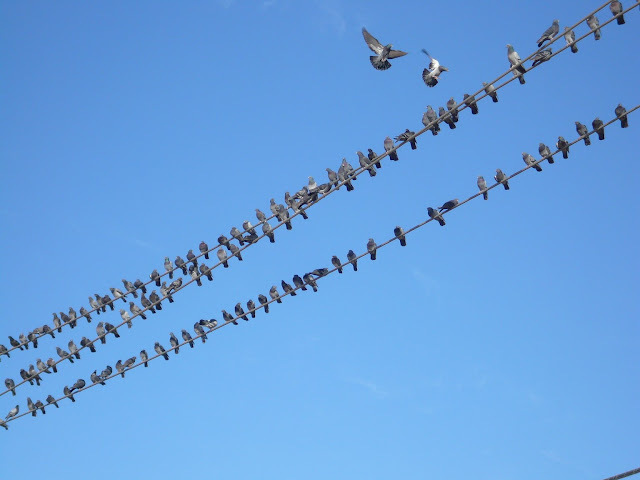 I think I discovered the all-time favorite pigeon gathering spot in central Phoenix. I stopped to take a picture of some new public art (to be posted later) when I looked up and spotted these guys watching me from the power lines above. I think this is the largest collection of pigeons I’ve seen in Phoenix. I think I’ve mentioned before that I live just a block away from the campus of Phoenix College. 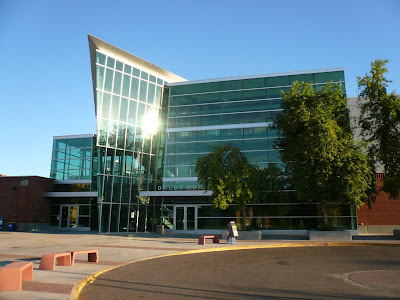 Today I’m featuring a photo of the Dalby Building on the campus. I sometimes walk on the campus grounds when out for an exercise walk and I always pass this building. In this picture, I caught it early in the morning when the rising sun was reflecting off of the glass and making patterns on the sidewalk. 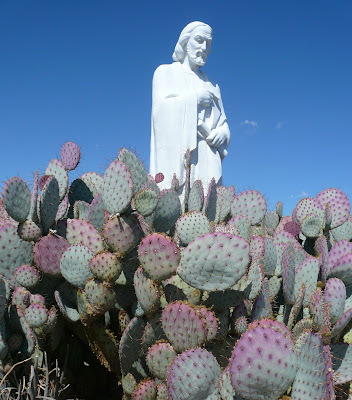 This statue sits in the middle of a church parking lot completely surrounded by a thick growth of prickly-pear cactus. I wonder if the cactus was planted there to protect the statue. I doubt that anyone would attempt to run off with this statue on a dark night with this thorny security device in place. 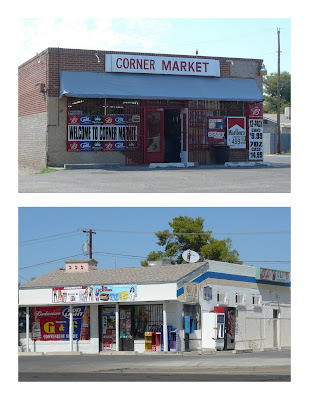 These types of corner markets are very rare in a city dominated by the huge chains like Circle K and 7-Eleven. I discovered these little markets quite by accident tucked away in the heart of two residential neighborhoods. Seeing them made me think of my childhood when my grandfather would walk me and my sisters down our street to a tiny corner market to pick out our choice of penny candy. It seemed like the choices were endless and as I think back, included a lot things that haven't been on a candy shelf for many years. With the multitude of chain convenience markets and multi-purpose gas stations, these little businesses have suffered greatly. It’s nice to see that some of them have survived. 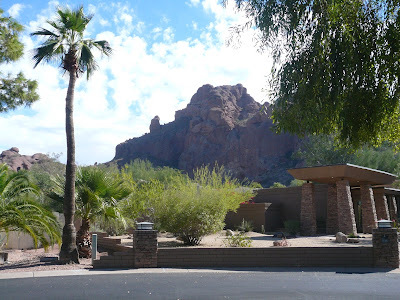 On the west end of Camelback Mountain attached to the “head” of the camel is a outcropping of rock called “The Praying Monk”. That name has been adopted because from a distance this formation resembles a monk on his knees praying. The above picture is taken close to the base of the mountain as near as the road gets to the outcropping of rocks. 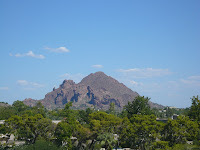 The small picture shows Camelback Mountain from a distance. You might have to click on this photo to see it better. So, what do you think? Does it look like a praying monk to you? By the way, Camelback Mountain is another Phoenix Point of Pride. 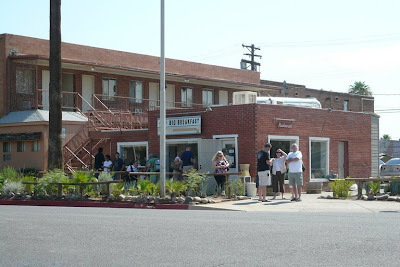 This tiny little plain-Jane restaurant near downtown draws huge, standing-room-only crowds every weekend. It’s located near the site of the Farmer’s Market so I pass it on the Saturday’s that I visit the Market and there is always a crowd waiting outside. If you check Matt’s Big Breakfast’s website, you’ll see the menu is pretty basic breakfast fare. I’ve never eaten there but, I’d say judging from the customers, it must be good. 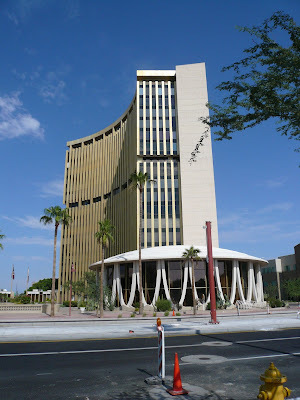 When the Phoenix Municipal Court was built, part of the project included the structural and exterior renovations of this building. Built in 1927, this was the original home of a J C Penney Department Store and later the home of Central Arizona Light & Power. It changed hands a few more times until the city purchased the building in 1959 and used it for office space until 1994. When the new Municipal Court building was approved, rehabilitation of this building was included in the project. 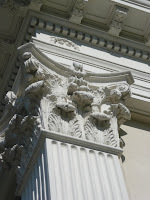 The small picture shows a little of the detail on the building. 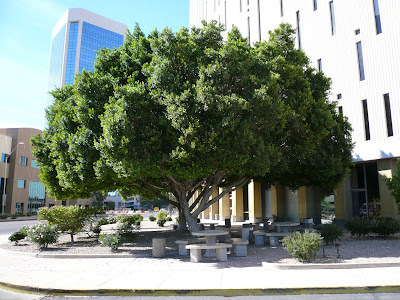 This court building in downtown Phoenix bears the name of Valdemar A Cordova who served on the Phoenix City Council from 1955 to 1959 and then went on to be a County Superior court judge. In 1979 he was appointed by President Jimmy Carter to the Federal bench making him the first Arizona Mexican-American to hold such a position and among the first nationwide. This building was completed 1999 and holds 38 courtrooms. Included in this building project was the renovation of another building that I’ll show you tomorrow.